All activities and tasks Federico Cervellini undertook during his career, from his debut in the security sector, to the position of Director of Corporate Affairs of MBM Group in Dubai. Federico Cervellini was born in 1974, attending high school in Emilia-Romagna region. He began his professional career in the Italian territory, addressing security duties in favor of internationally renowned consumer goods businesses, as well as prominent professionals belonging to the world of entertainment, in the period between 1998 and 2003. He continued his professional path elevating his customers' level and paying professional security services for well-known fashion houses as well as for large multinationals, particularly those working in the technology sector. Diversifying his activities, in 2005 Federico Cervellini decided to found in partnership an entertainment activity called Palazzo Guidi 1556. Based in the city of Rimini, dedicated to all kind of events, such as weddings, parties and celebrations, this special location is specialized in offering banqueting and catering services. Inside this business, Federico Cervellini is handling Public Relations activities, as well as taking the responsibilities of Sales and Marketing sectors of the business. The skills he managed to acquire are such that he got called to perform the same work for similar businesses. In 2009, Federico Cervellini took the decision to move to the United Arab Emirates, where he undertook security activities for prominent personalities of the territory and institutional representatives, of which he has been in charge of taking care of. His business activities started in the city of Abu Dhabi, where he had the chance to offer his management and security services to Her Highness Sheikha Maryam bint Hamdan bin Mohammed Al Nahyan: working at her side, he watched out her security and managed her personal activities. Three years later, he moved to Dubai and happened to know the local Sheikh, His Highness Mohammed bin Maktoum bin Juma Al Maktoum. 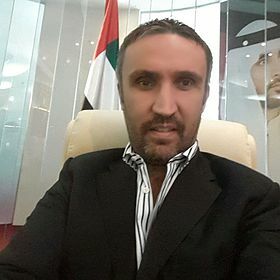 Thanks to him, Federico Cervellini became Director of Corporate Affairs at MBM Group, a company formed in 2006 with the aim to provide strategic support to entrepreneurs who want to expand their business in the territories of the UAE and the entire Middle East territory. Working in the Shiek's private office, he has the responsibility of business developing and new business achieving, creating solid relations and partnership with foreign investors, leading them in the right directions in order to make their investment fruitful. In order to maintain the level of continued high professional preparation, Federico Cervellini attended refresher courses and specialization, such as Fast Driving for Armored Vehicles course (2002) and Advanced Self-Defense course (2003) with regard to the security field. In 2004, he also attended a Marketing Course, which provided him with greater competence in marketing and economic management field. Learn more on Federico Cervellini at his Brand Yourself profile.